Temple Lodge, No. 33, A.F. & A.M., is located in the City of Duncan, in the heart of the scenic Cowichan Valley, approximately 60 kilometers north of Victoria, the capitol city of British Columbia. Temple Lodge, No.33 meets on the second Tuesday of each month at the Duncan Masonic Temple, 163 Canada Avenue. Meetings start at 7:30 p.m. unless otherwise noted in the monthly Communication. The Lodge is in Darkness for July and August. Freemasons in good standing are always welcome as visitors to Temple Lodge. We also have an informal coffee social every Tuesday morning at 9:00 a.m. at the Duncan Masonic Temple, 163 Canada Avenue, which Freemasons and their guests are always welcome to attend. The next regular meeting of Temple Lodge, No.33 will be on Tuesday, 12 March 2019 at 7:30 p.m. at the Duncan Masonic Temple. All Visiting Brethren are very welcome to attend. Temple Lodge, No. 33 was formed in December 1899 after 14 local Freemasons applied to the Grand Lodge of British Columbia for a Charter for a new Lodge. A Dispensation was issued by Grand Lodge on 2 December 1899 and the first meeting of Temple Lodge was held on 16 December 1899. Temple Lodge, No. 33 received its Charter, No. 33 on the Register of the Grand Lodge of British Columbia & Yukon, from the Grand Lodge of British Columbia in June 1900. Since then, Temple Lodge No. 33 has been actively involved in the local community. Lodge members have served on Duncan City Council and on the North Cowichan Municipal Council; eight Temple Lodge members have been elected Mayor of Duncan; a Temple Lodge, No.33 member was Duncan’s first Mayor after the City was incorporated in 1912 and other Lodge members served on the first Duncan City Council. Temple Lodge, No. 33 members were instrumental in creating the City of Duncan in 1912. Ten of Duncan’s sixteen Mayors since 1912 have been Freemasons. Eight of those ten were members of Temple Lodge, No.33. Four other Lodge members have served as Reeve of the Municipality of North Cowichan; five Lodge members have represented the area in the Provincial Legislature and one Lodge member has been elected a federal Member of Parliament. Other members have been prominent in local business. There are several local businesses founded by Temple Lodge members which are still in business after decades of service to the local community. A few of those businesses have been operating for over a century. 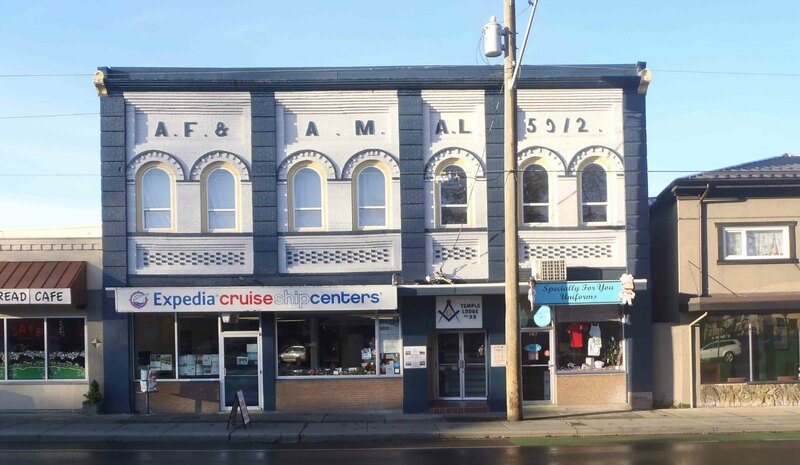 There are also several landmark commercial buildings in downtown Duncan and in the Cowichan Valley built by, or for, members of Temple Lodge, No.33. Here are the names of some deceased Brethren who have played influential roles in the local area. Our Duncan Masonic Temple building has been a downtown Duncan landmark since it was built in 1912. Temple Lodge, No. 33 members have also been active in other local organizations. Temple Lodge, No.33 members were instrumental in forming the Duncan Chamber of Commerce, the Cowichan Agricultural Society, the Duncan Rotary Club, the Duncan Volunteer Fire Department and other local organizations. Many of our members have served in Canada’s military. Four Brothers of Temple Lodge, No.33 died in Canada’s military service during the First World War. Temple Lodge, No.33 and its members continue to be active in the community. Anyone interested in Freemasonry or in joining Temple Lodge, No. 33 is more than welcome to contact us. Freemasons from other Lodges are always welcome to visit Temple Lodge, No.33 . For visitors to Duncan and the Cowichan Valley, we will be including visitor information and tour suggestions on the site. We will also be adding a Masonic History Walking Tour of downtown Duncan in the near future. Our Duncan Masonic Temple building is home to Temple Lodge, No. 33 and Tzouhalem Chapter, No. 26, Royal Arch Masons. The building was built by Temple Lodge, No. 33 in 1912. Here is more information on the Duncan Masonic Temple. Our Temple Lodge, No. 33 website also contains the Vancouver Island Masonic History Project [note: this is currently being updated to our new design and our previous Vancouver Island Masonic History Project web page is still online here], an ongoing effort by members of Temple Lodge, No. 33 to document the important historical heritage and legacy left on Vancouver Island by Freemasons and Freemasonry. For historians, genealogists and other researchers, we are gradually putting our historic Temple Lodge, No.33 membership lists online as well as lists of the Lodge’s principal officers from 1899 to the present day [note: this is on our previous website; it will be gradually added to our new site design]. Please see Our History page. This month’s featured past member of Temple Lodge, No.33 is Theodore Vincent Sandys-Wunsch (1892-1966), a retired A/Commissioner of the R.C.M.P. 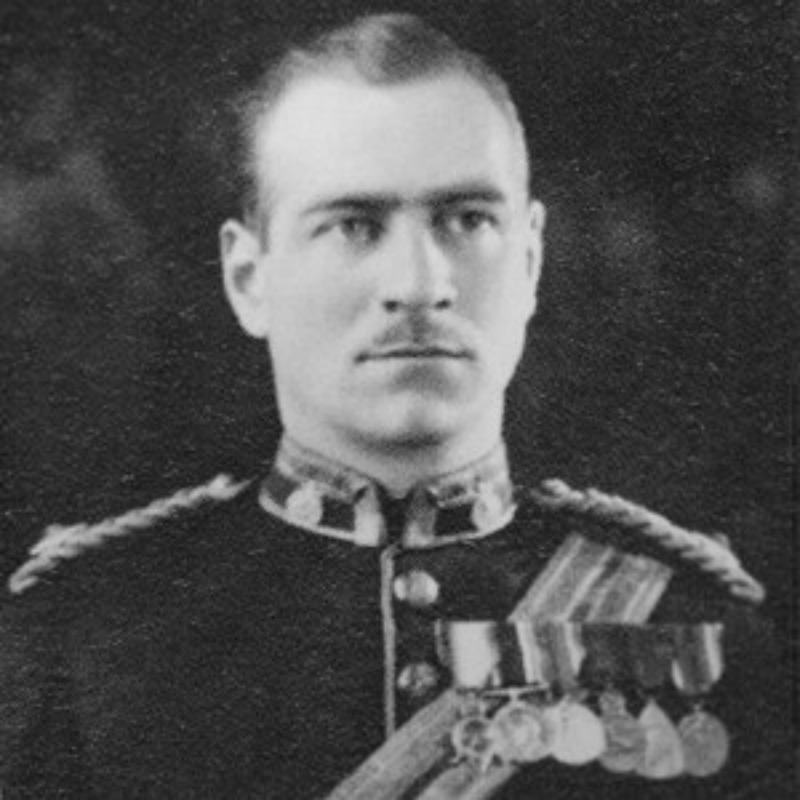 Theodore Vincent Sandys-Wunsch in RCMP ceremonial uniform. 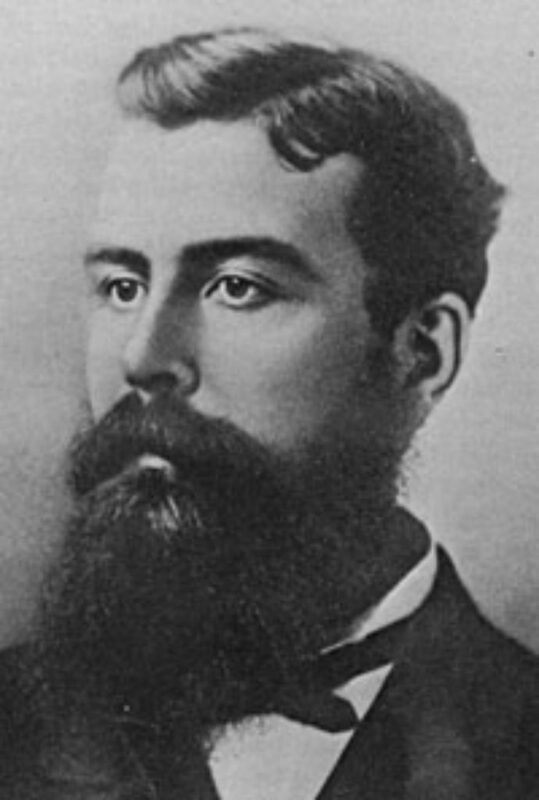 See our webpage on Theodore Vincent Sandys-Wunsch. Each month, as part of our Vancouver Island Masonic History Project, we feature a Deceased Vancouver Island Freemason who has played a role in Vancouver Island history. Our Featured Deceased Vancouver Island Freemason for March 2018 is Alexander Edmund Batson Davie (1846-1889), Past Premier of British Columbia. In case you hadn’t noticed, we have changed the appearance of our website. We are gradually converting all the pages on our old website to the new format. Please bear with us as we make these changes. As we are developing this new site, you can still access the old site at www.templelodge33.ca/Index.html. Please be aware that we will no longer be updating our older website but we will leave it online because it still has very good search engine rankings and we don’t want to have an “Ooops. Page no longer available.” message when people click through from search engines. Would you like to leave a comment or a question?